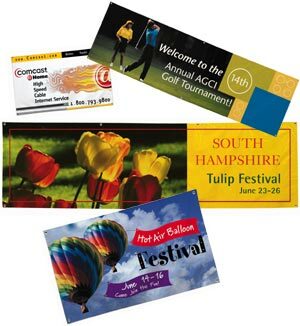 Create eye popping colorful poster print banner displays! If you're looking for bold beautiful poster print banners for indoor applications, look no farther. These low cost digital poster print banners are printed on heavy weight photo satin paper with the option of matte or gloss lamination. Using your design and printed with our ultra high resolution photo quality banner poster printer (1,440 dpi), these poster print banners are sure to produce the eye catching results you're looking for. Concord Signs will work with you to choose the needed materials for your poster presentation. There are many papers and finishing options available to suit your image and budget needs. In a hurry? Be sure to let us know so that we can relieve your stress by delivering your posters just in time for your last minute meeting or event. Photo-realism or simple text virtually explode with the use of full color. Attention grabbing, full color poster print banners come to life with our large format full color poster print banner printer. Let your imagination run wild. If you can envision it, we can print it. Your poster print banner can be printed on a variety of banner print materials including: poster paper banner material, tear resistant banner material, heavy weight vinyl banner material and other poster print banner materials. From 1 banner poster to 1,000 banner posters, our digital banner print poster department can meet any of your full four color digital banner printing needs. Our only limitation is your imagination! Contact us about your poster print banner making needs, we are your poster print banner maker! Digital color poster prints are output directly from your computer file to continuous tone full color prints at an apparent 1200 dpi. Anywhere you need to display large photographic- quality images. CONTACT CONCORD SIGNS TODAY, AND WE'LL WORK UP THE PERFECT FULL COLOR DIGITAL PRINT TO MAKE YOU LOOK GOOD.